As Attorney General in the George W. Bush administration, Mr. Ashcroft has been credited with overseeing an historic era of safety and security for our country in the wake of the tragic events of September 11th. Under his watch, the Justice Department focused on its number one priority: preventing another terrorist attack. Mr. Ashcroft led the Department in initiating a tough anti-terrorism campaign that has assisted in disrupting numerous terrorist plots worldwide, dismantling terrorist cells in many cities across America, and convicting nearly 200 individuals associated with terrorism-related investigations to date. In addition to his focus on national security, Mr. Ashcroft lead the Department in taking criminals off the street, reducing gun crime, targeting illegal drugs, and protecting civil rights so no American felt outside the protection of the law. Violent crime has dropped to a 30-year low as the Department has employed tough laws and tough penalties against criminals who have victimized the innocent. The Department has implemented President Bush’s Project Safe Neighborhoods’ initiative, increasing federal gun prosecutions by 68%. The war on drugs has been reinvigorated and the country is celebrating record lows in student drug use while government seizures of heroin have doubled in two years. The Justice Department also developed the government’s first ban on racial profiling by federal law enforcement, successfully resolved decades-long civil rights investigations, and worked to bring communities together in a way that respects the rights of all Americans. At the direction of President Bush, the Department established the Corporate Fraud Task Force to restore integrity to the marketplace by cracking down on companies and corporate executives who abused the trust of their employees and investors. Mr. Ashcroft’s career of public service began in 1973 when he became Missouri Auditor; he was later elected to two terms as Missouri’s Attorney General. His service to the state of Missouri continued when he assumed the position of Governor in 1985 (through 1993). As Governor, he spearheaded the state’s efforts in reducing the use of illegal drugs and balancing eight consecutive budgets. He also served as Chairman of the Education Commission of the States. 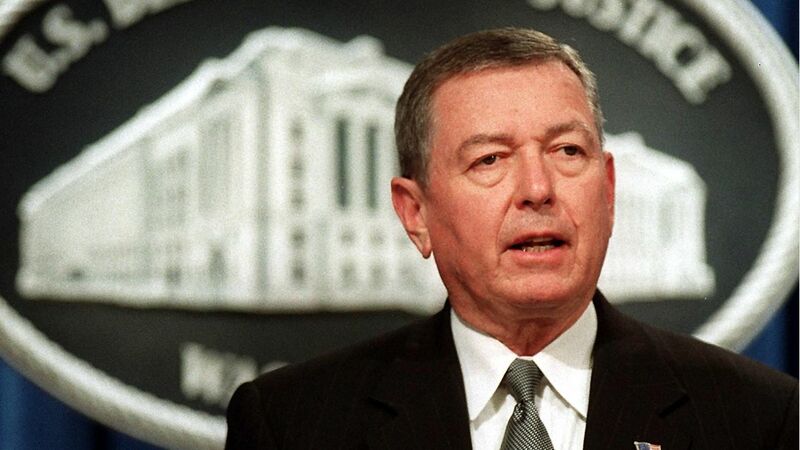 Fortune magazine rated John Ashcroft one of the “Top Ten Education Governors,” and Financial World and City and State magazines credited him with making Missouri one of the best financially managed states. Mr. Ashcroft was elected to the U.S. Senate in 1994, where he worked to combat illegal drugs, increase the quality of public education, reduce crime and safeguard the rights of crime victims. He also co-sponsored the re-authorization of the Violence against Women Act, and fought to toughen penalties for gun crimes. Prior to entering public service, Mr. Ashcroft taught business law at Southwest Missouri State University in Springfield. He authored a book honoring his father, Lessons from a Father to His Son, and co-authored multiple editions of two college law textbooks with his wife, Janet. The Ashcrofts have three children: Martha (Mrs. James Patterson), John and Andrew, and one grandchild, Jimmy Patterson.